Lifestyle design and adventures with a soul. There are places that you’ve never given much thought – sitting idly somewhere on the periphery of your mind, their existence acknowledged but never really explored further. Then, suddenly, they leave a mark so profound you can’t quite shake it off. That’s how my adventure with Stockholm began. I’ve always been fascinated with Scandinavia, but somehow that sentiment never quite extended to Stockholm. I’ve visited it over ten years ago on a rather dreadful January day, the hood of my puffa jacket sliding down my face as I tried navigating the streets, the snow melting on the pavements and slowly turning into grey mush. 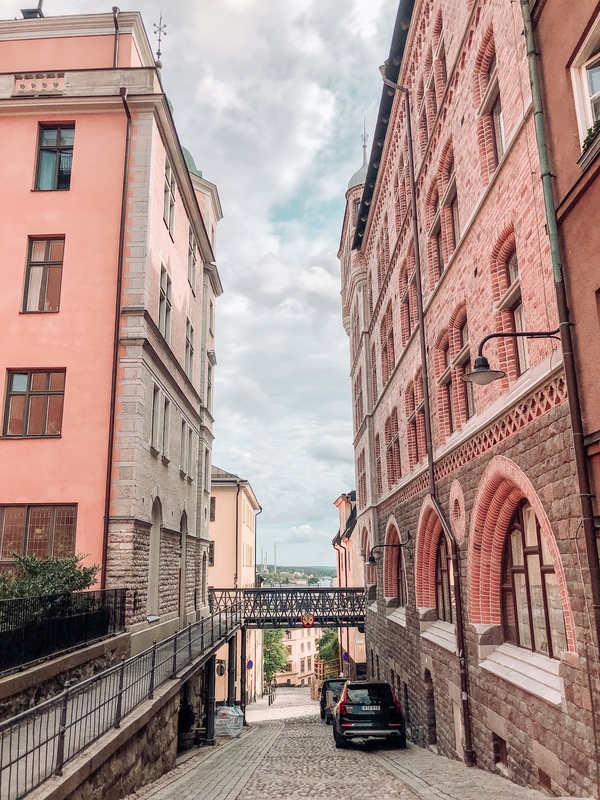 I neither liked it or disliked it but, having booked a flight to visit my family in Västerås in August this year, I decided to give Stockholm another try. It might’ve been that late summer feel that made all the difference – the warm light gently diffused by the clouds, illuminating the colourful buildings and sparkling in the water. Or perhaps it was me that was different. 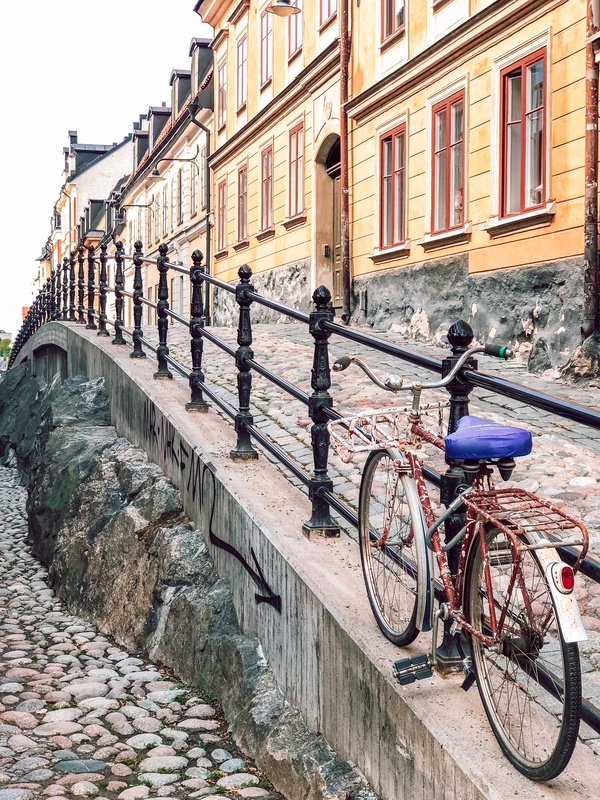 Either way, on the very first evening of my arrival, as I crossed the bridge from Södermalm to Gamla Stan – the dusk slowly turning into night as the lights went up, bicycles passing me by and the smell of kanelbulle filling the air – I felt both enchanted and at home. Strolling around the town felt wonderful and strangely familiar. The best way I can describe it is coming to a warm home after a cold day out. There are a few places that made me feel this way and that feeling stayed with me for the rest of the trip. 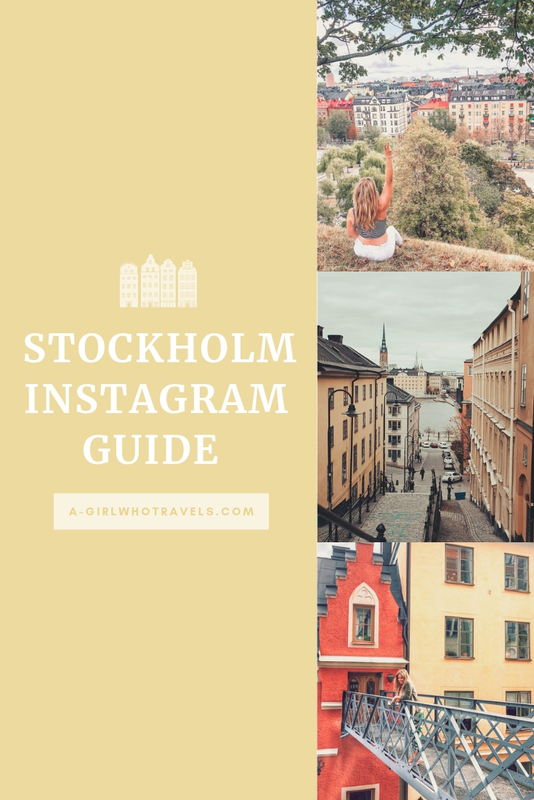 I’m not sure if this is how you’ll feel about Stockholm you but in case you want to give it a try, let me take you around my favourite – and most enchanting – parts of the city. 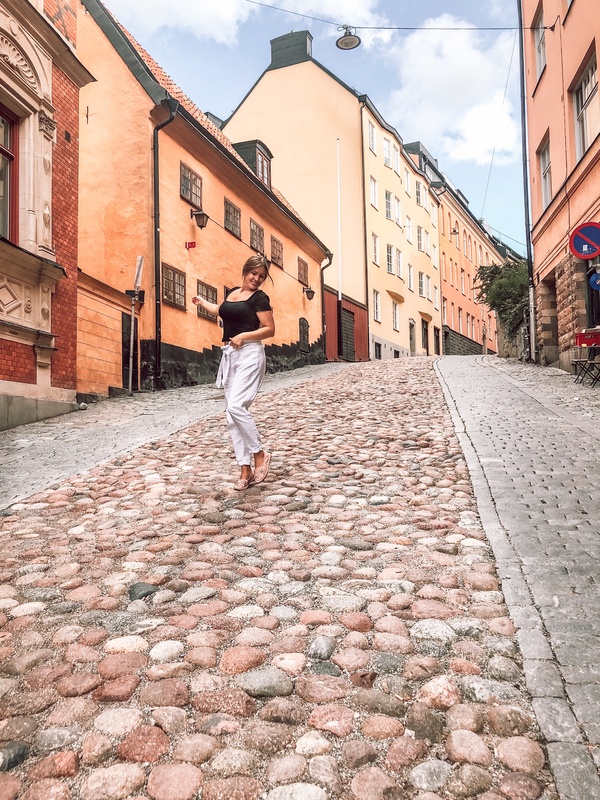 Gamla Stan (The Old Town) may seem like an obvious choice when it comes to Stockholm’s most beautiful locations, but I much preferred the quieter and incredibly charming northern part of Södermalm where I was based for the majority of my stay. 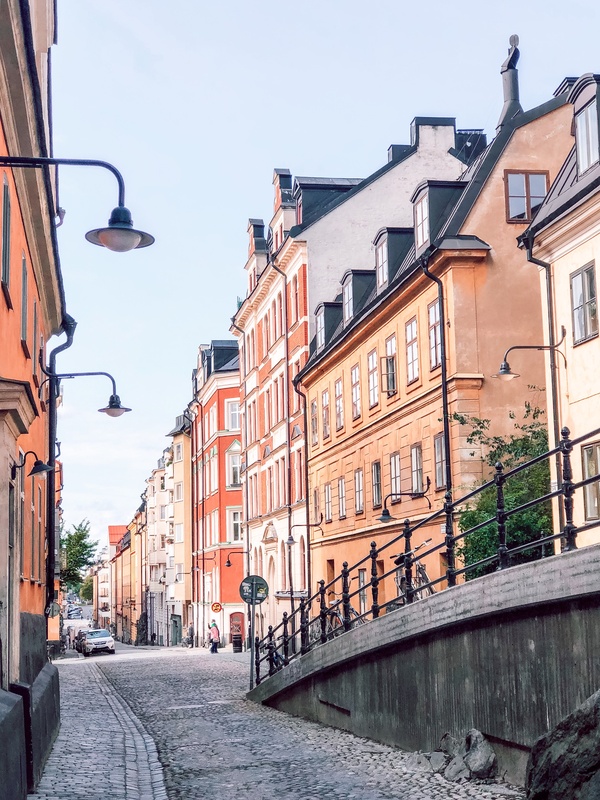 The streets surrounding Mariahissen are particularly beautiful, every street corner bearing a wonderful surprise – staircases leading to narrow alleyways overlooking the city, cobblestone streets waving their way around the hills, tiny bridges crisscrossing the landscape. 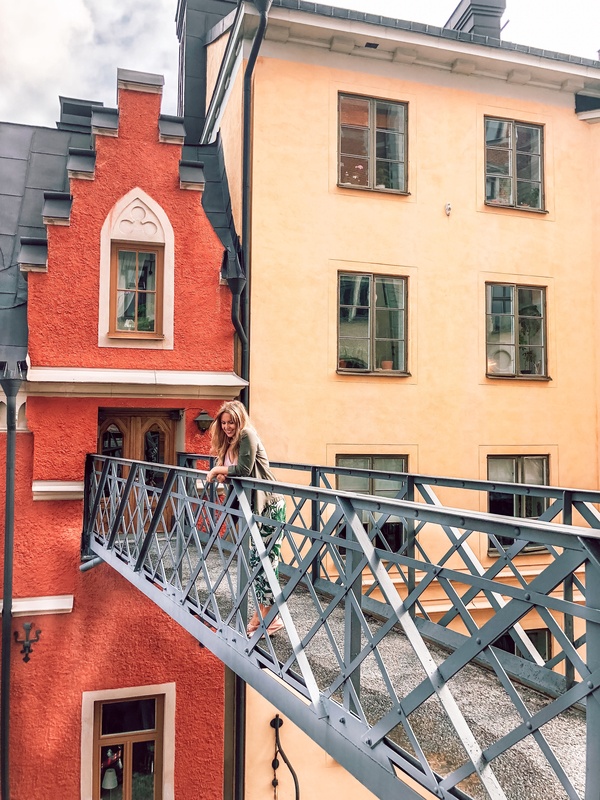 Don’t miss Mariahissen itself – the view from the top of the building faces colourful, almost castle-like townhouses connected by a narrow bridge and looks just gorgeous. 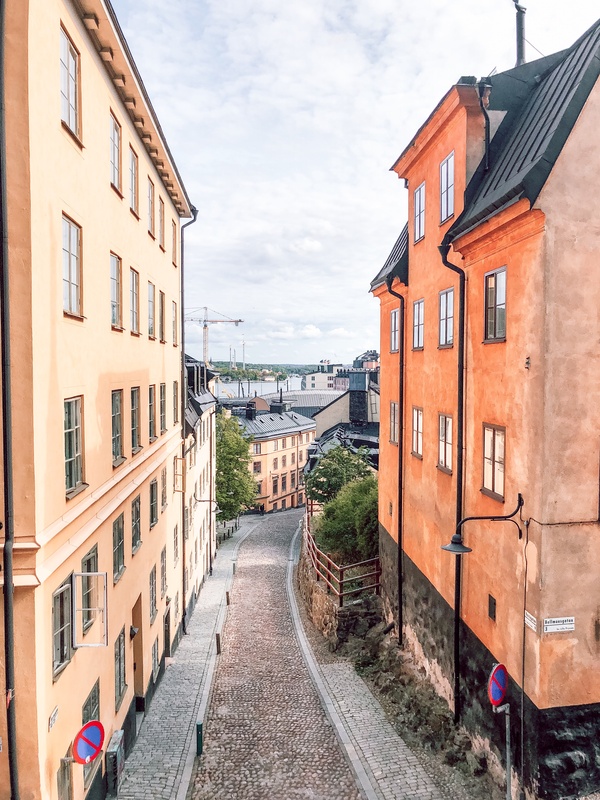 From there, stroll around Bellmansgatan, particularly the part where it reaches Brännkyrkagatan. 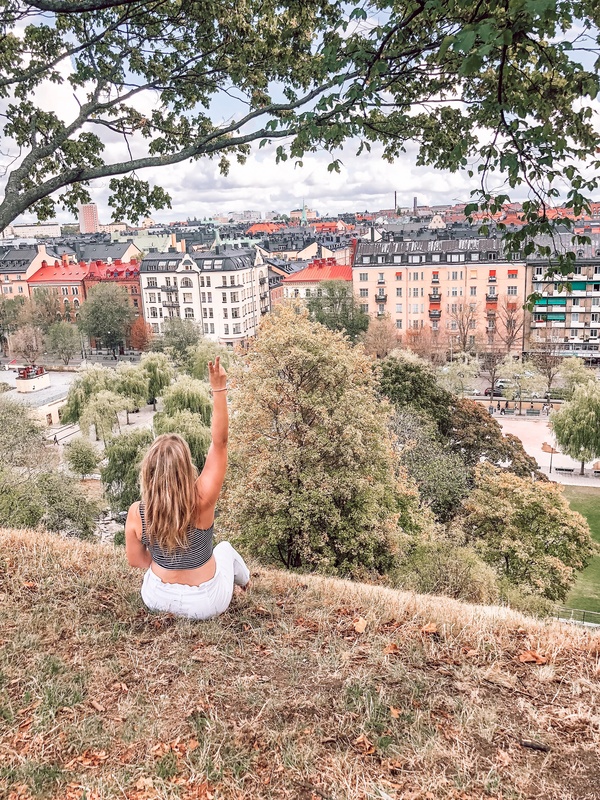 The city views from Monteliusvägen are also lovely, and if you walk further down towards Skinnarviksberget, you’ll be rewarded with a sight of gingerbread-like houses across the river. The Rival Hotel south of Mariahissen is another magical place. 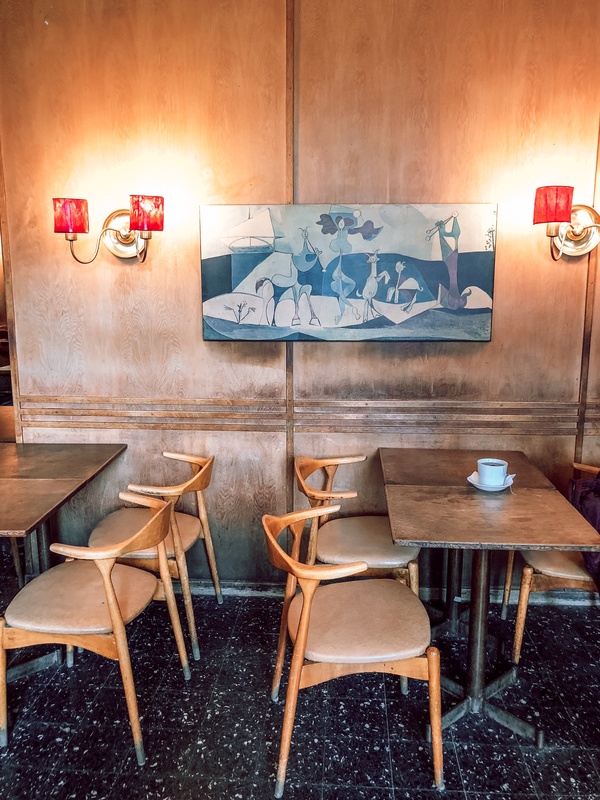 Red velvet seating, old movie photographs hanging on the walls, gold details and dimmed lights reign all throughout the building, giving it a sultry, almost cinematographic feel. All this is for a good reason, as the hotel houses a cinema in what used to be an old theatre next door. There’s also a café and a bistro upstairs, emanating a similar charm. 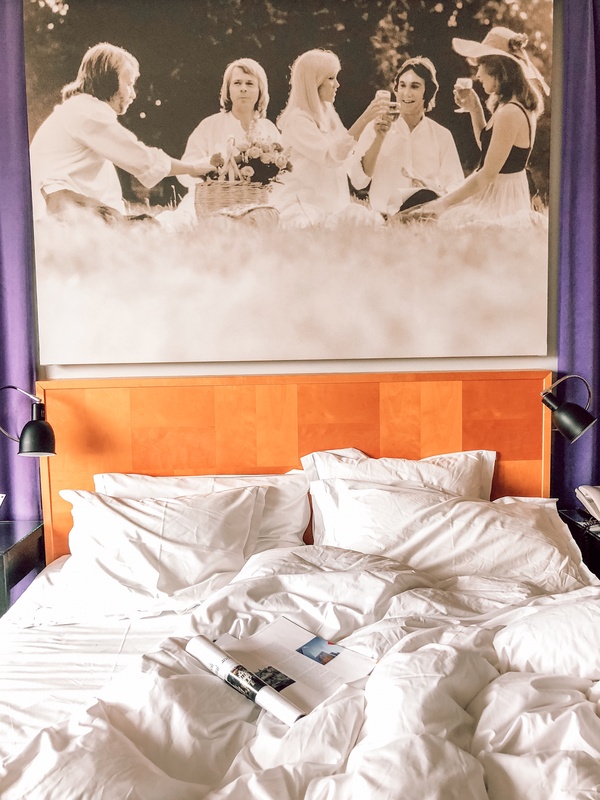 As I later found out, The Rival Hotel is owned by Benny Andersson, a member of ABBA – which would explain the photo of the group hanging over my hotel bed! 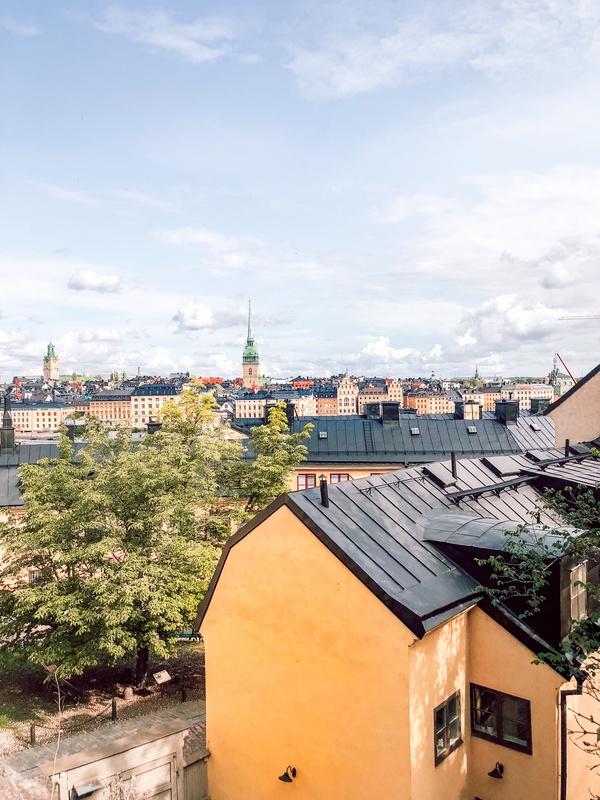 One of my favourite memories of Stockholm is waking up to the sight of the sun-drenched square outside The Rival, with townhouses towering over the trees. Magical! I don’t know what it is about Vasastan but the entire area has this incredibly warm, homely feel to it. 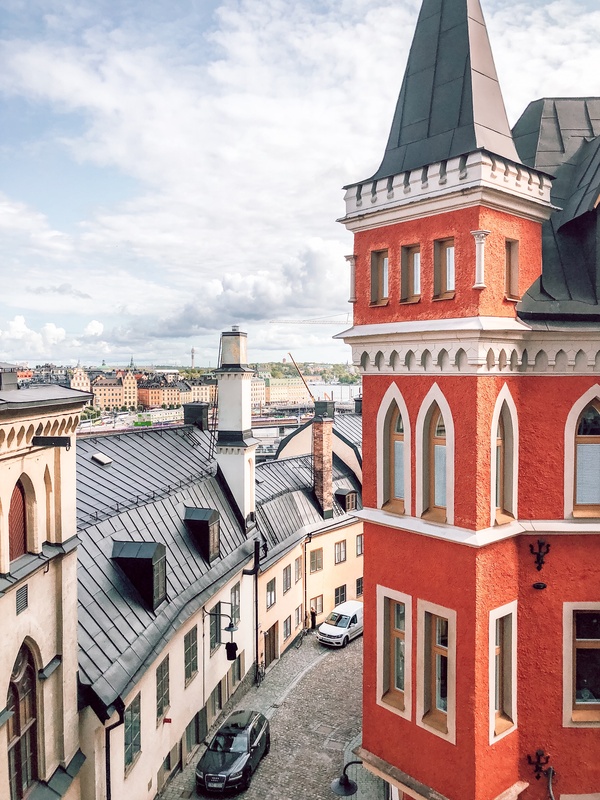 Marked by neo-Renaissance buildings in what appears to be typical for Stockholm warm block colours and filled with charming cafes, Vasastan is a perfect place to unwind. While central, the area has a lovely sense of calm to it. 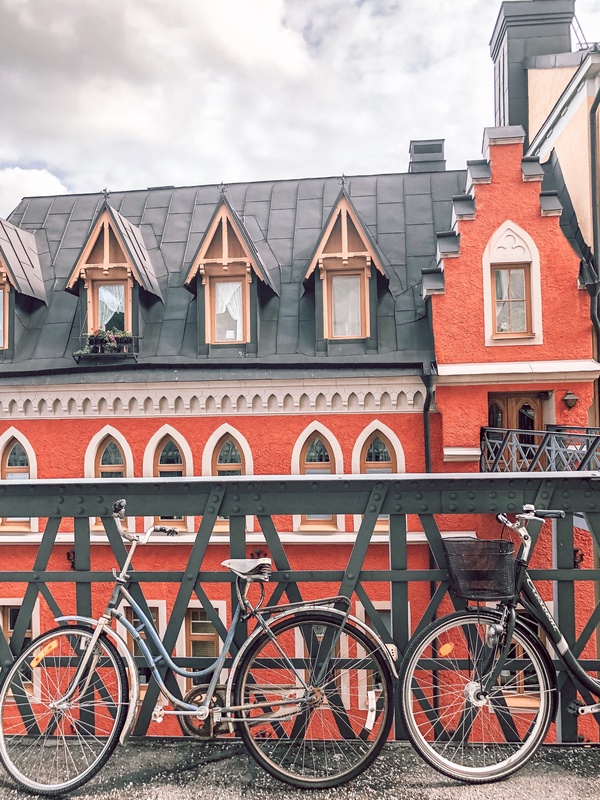 Start off on Tegnergatan – a grand street with a welcoming, residential feel. 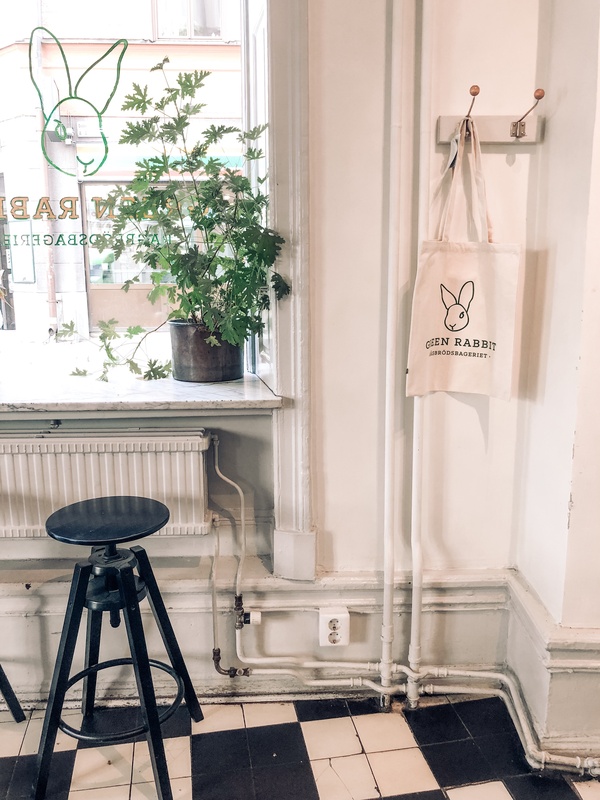 If you need a little pick me up, grab a latte and cinnamon buns at Green Rabbit and head north towards Stockholm Public Library (or Stadsbiblioteket in Swedish). 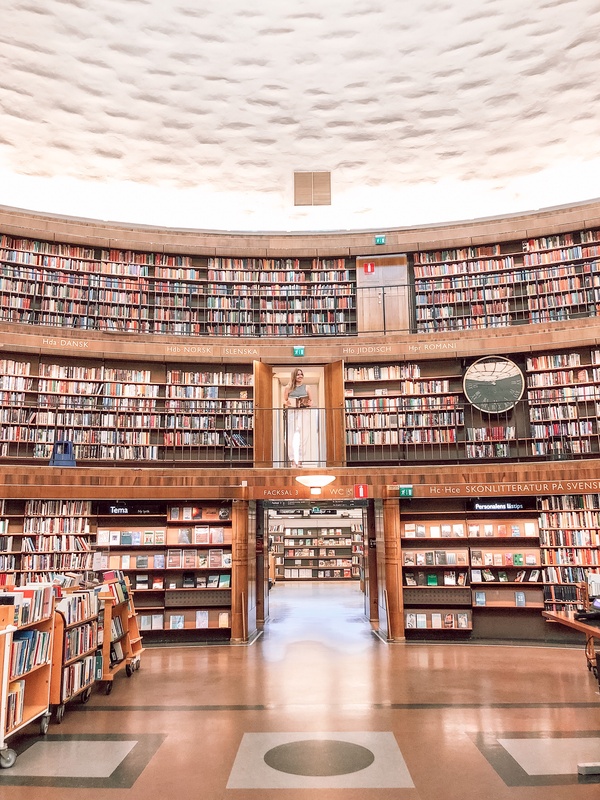 It may seem random but trust me, it’s worth it – it’s not just any library. The building is centred around a rotunda, with bookshelves covering it from top to bottom, forming a circle in an almost temple-like manner. 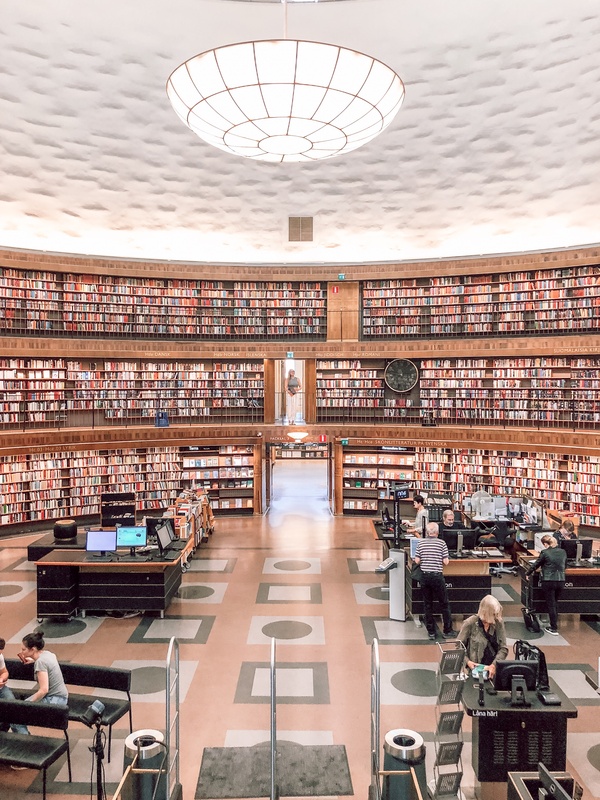 The smell of books and hushed conversations always remind me of my childhood and trips to the local library (except mine wasn’t quite as impressive). 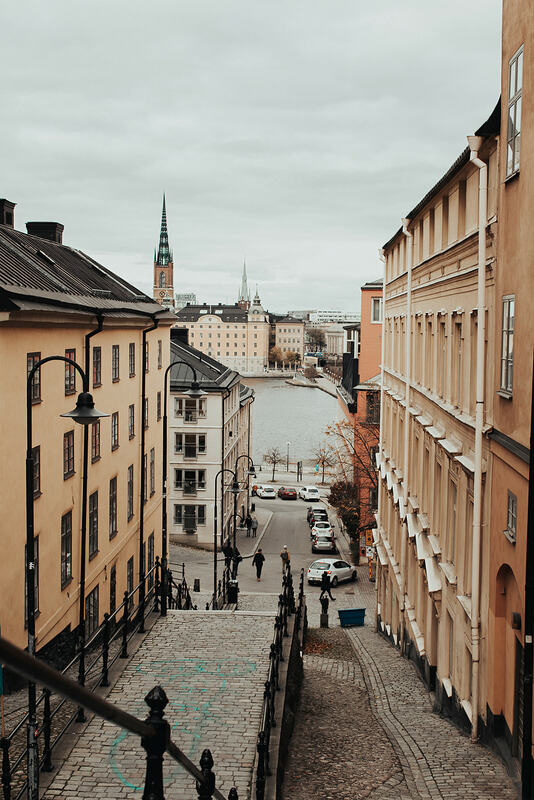 It was lovely to rediscover this feeling of nostalgia in Stockholm. Stadsbiblioteket sits on the edge of Observatorieluden Park, named this way because of the Old Stockholm Observatory. I have a feeling that the park will forever remain one of my favourite places in the city. 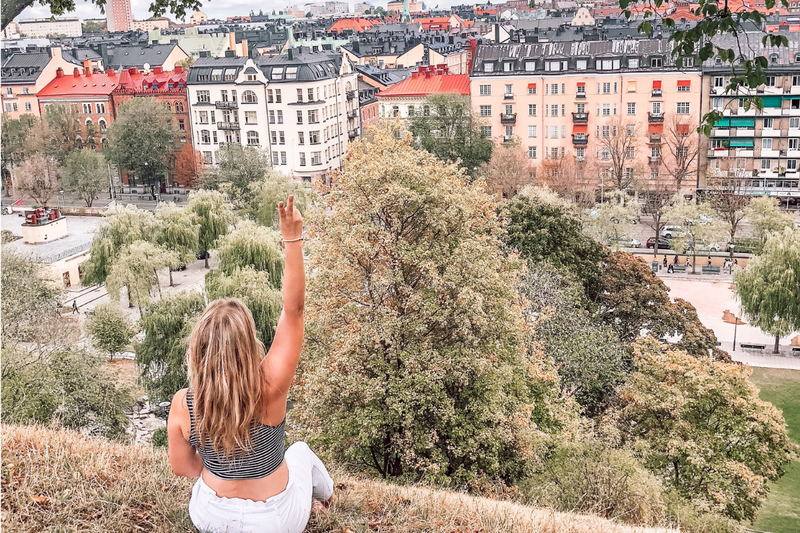 I visited it just hours before catching my flight to London and the view stretching from the top of the hill is one of the most beautiful I got to see in Stockholm – a perfect way to say goodbye to what’s quickly become one of my favourite capitals. 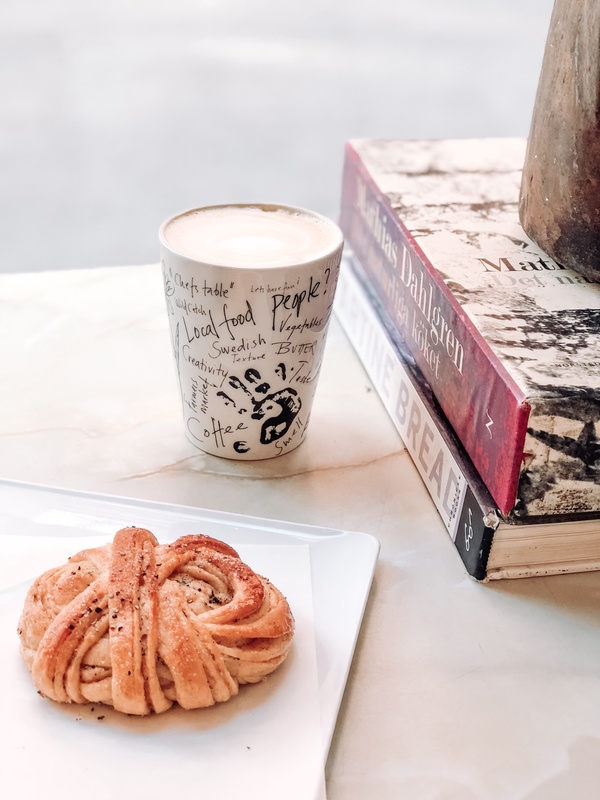 The Swedish concept of fika, which can be roughly translated as ‘coffee break’, is pretty much institutionalised in the Swedish mentality. However, fika is so much more than the simple act of grabbing your favourite brew. 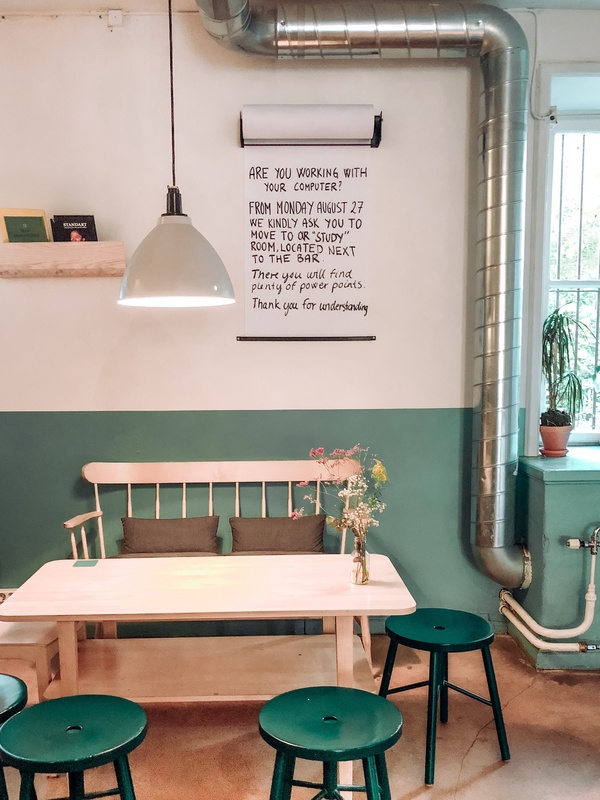 It’s the time to reconnect with friends, co-workers or loved ones, focus on the ‘now’ and enjoy the simple things in life – like a good conversation over a cup of coffee and cake. Fika goes hand in hand with another delightful concept devised by the Swedes – lagom, which focuses on living a simple, balanced life. It’s about making the ordinary moments that little bit special and a little bit sweeter, and I believe there’s a special kind of magic in that. You can enjoy fika at home, work and, of course, at a café – here are some of my favourites. There are places you enjoy, and there are the ones filled with magic, where you find yourself extending every task into infinity just so you can stay that little bit longer. That’s how Konditori Valand felt to me. My absolute favourite café in Stockholm, Valand is a place like no other. It remained unchanged since its creation in 1954, the décor paying homage to the mid-century era. At Valand, a sense of melancholy cuts through the air, and you can’t quite get enough of it – at least I couldn’t! 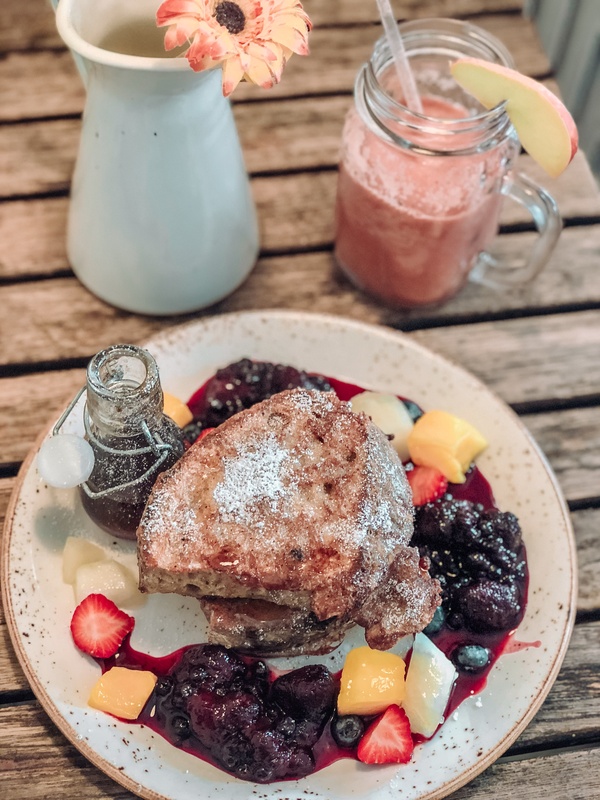 Millenial food trends have no place here – the selection is wonderfully simple and homely, with tea, coffee (forget latte or macchiato) and home baked cake reigning the menu. Another favourite of mine, while very different from Valand, Green Rabbit is equally charming. Sat right on the edge of residential Vasastan and trendy Norrmalm, the interior is a nod towards Scandinavian simplicity. Green table tops contrasting against the black and white checked floor are the only splash of colour in an otherwise white-toned café. The menu is equally simple and delicious. 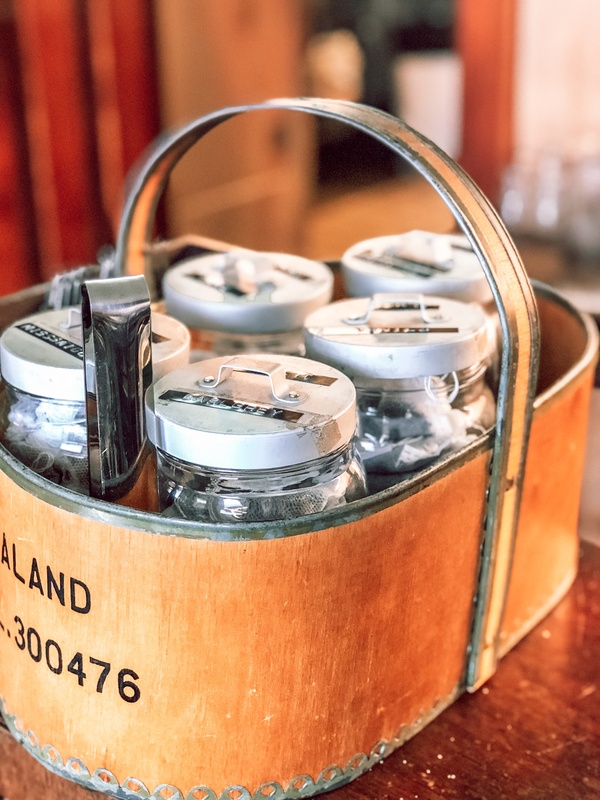 Expect freshly made rye bread, pastries (including the famous kanelbullar, of course!) and great coffee, served in homely mugs. 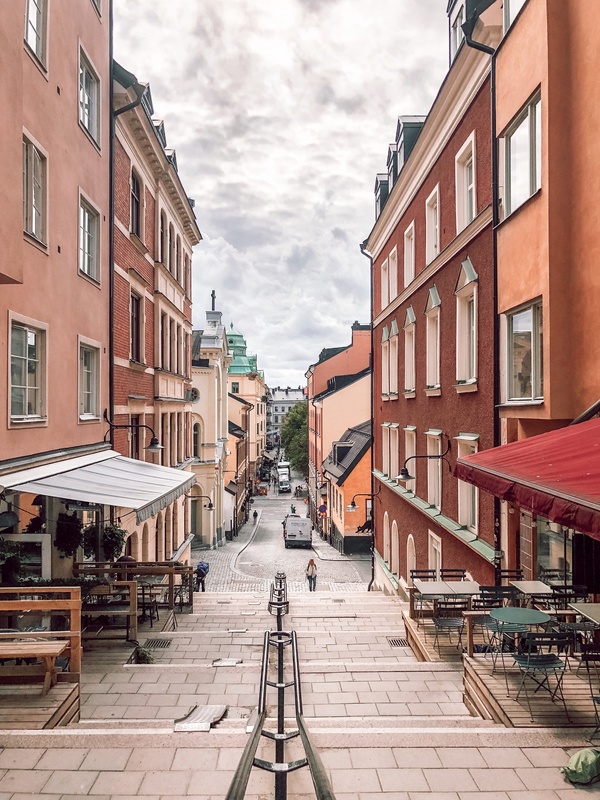 Bright, relaxed and cozy, Drop Coffee sits right next to a fun little street in Södermalm, lined up with comfortable benches where you can spot locals sipping their coffee or just sharing a chat. What I found particularly wonderful is that this ‘routine’ extends to Monday mornings – a stark contrast to London. 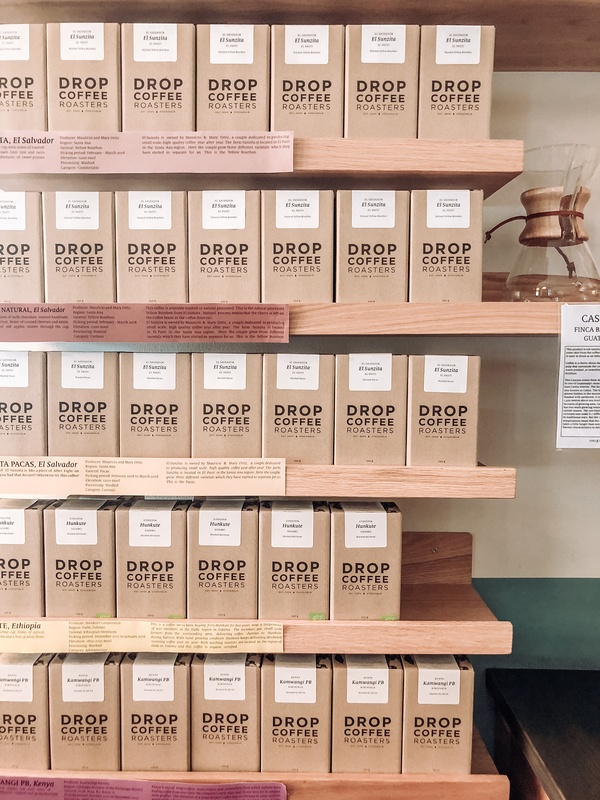 The tradition of fika reigns at the café, and for a good reason – Drop Coffee came in second at the World Coffee Roasting Championship in 2015 so they certainly know their stuff! The large windows bring light to the space and wooden chairs with two-tone mint green walls acting as a backdrop give it a cozy, inviting look. 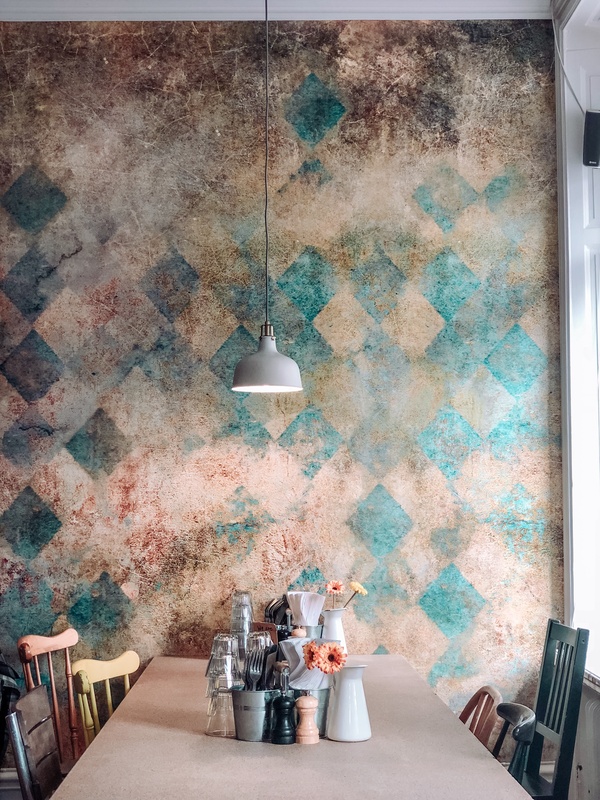 STHLM Brunch has a very London feel to it – that goes for both the eclectic interiors and the ever-present avocado on toast and acai bowls. 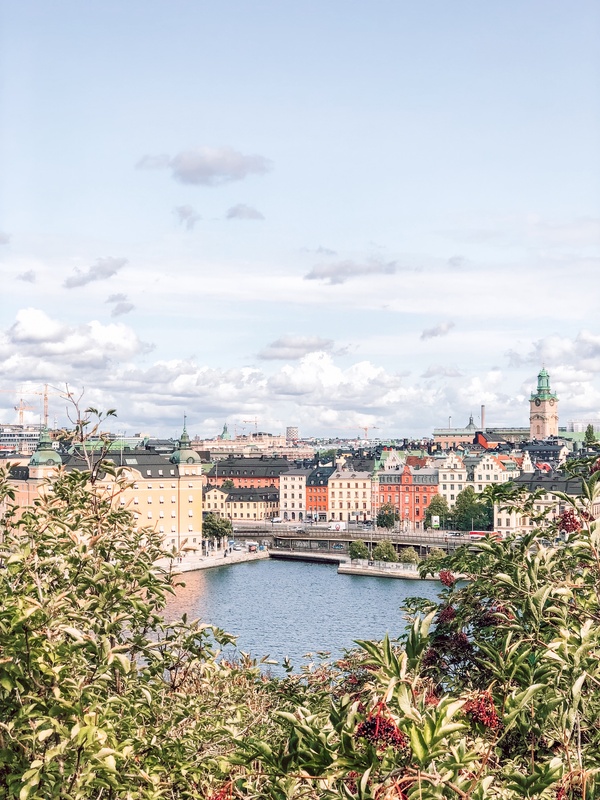 While it may not be your ‘traditional’ Swedish café, it without a doubt has some of the best (and certainly most Instagrammable) brunch options in Stockholm! It’s a perfect place if you want to indulge in more than just a simple coffee and cake, and a wonderful way to start your weekend. 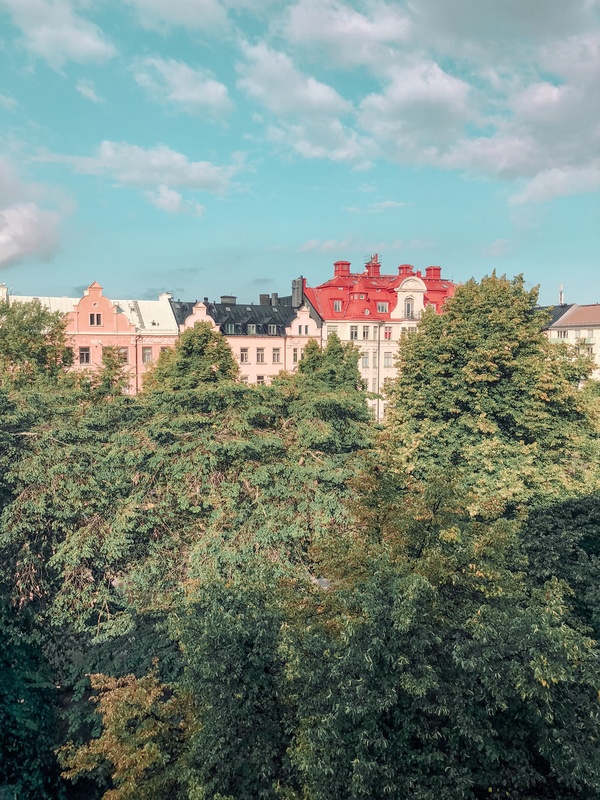 I was in Stockholm only for a couple of days and I’ll be sure to update the list following my next visit – which is less than a week away! 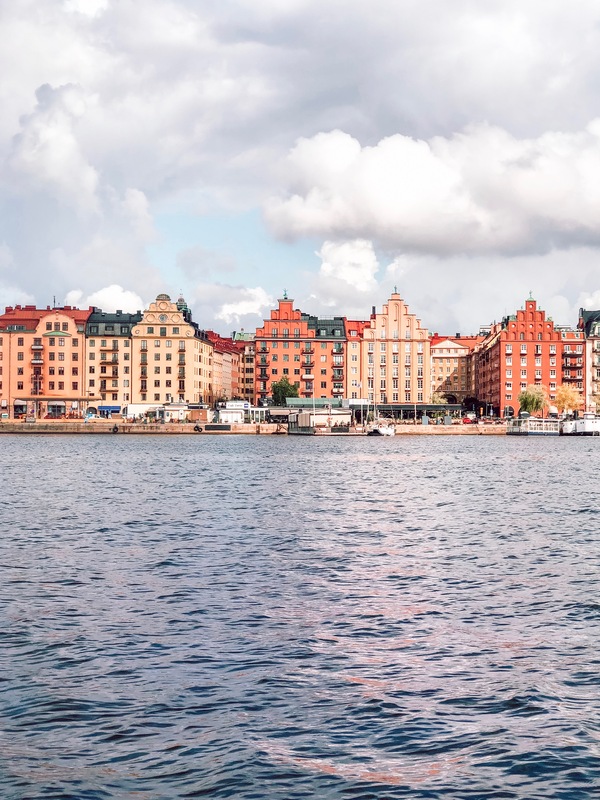 Believe it or not but Stockholm charmed me so much, I booked a one-way flight the day after I left. If this isn’t a testament to just how magical it is, then I don’t know what is! It was really nice to meet you at the Wowanders event yesterday. Love your blog and your photos! Amazing photos from Stockholm Marta! What´s the place where you took the first one? Oh my this is amazing. I’m going to Stockholm later this year and you just gave me so much inspiration!! Great job and love all the photos you got. Hello from a fellow Londoner!